Fourty-one 3 minute exposures at ISO 800 with no dark frame subtraction were stacked with Deep Sky Stacker (resulting in a 2 h 3 min exposure) and further processed in Adobe Photoshop. The dark background surrounding the nebula consists of twenty 3 minute exposures only (not all fourty-one exposures could be used due to a different framing of the images). Equipment: Canon EOS 450D Baader modified camera, TeleVue Paracorr Type II coma corrector, 16" f/4.5 "Ninja" dobsonian telescope riding on a dual-axis Tom Osypowski equatorial platform, Lacerta MGEN autoguider, Lacerta off axis system (field of view comparison: image of the moon with the same equipment). 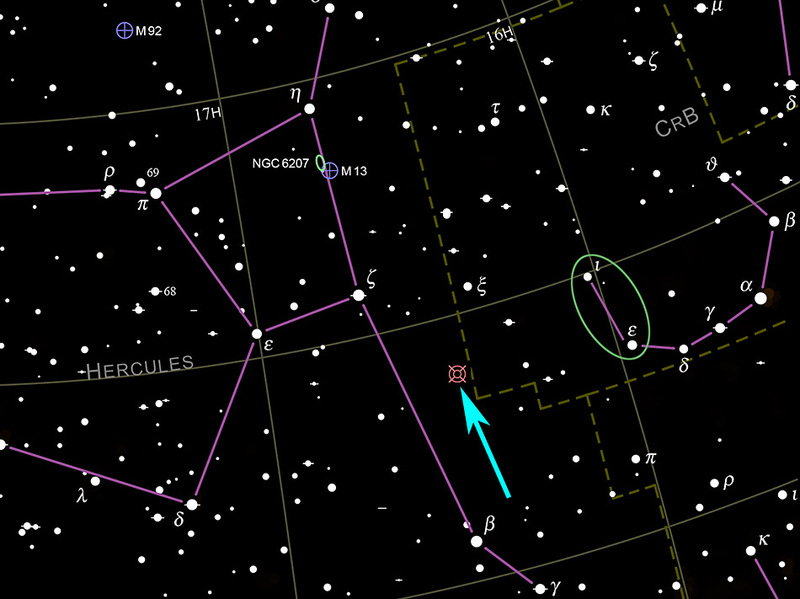 Star hopping to Abell 39: A nice starting point is the constellation Corona Borealis. 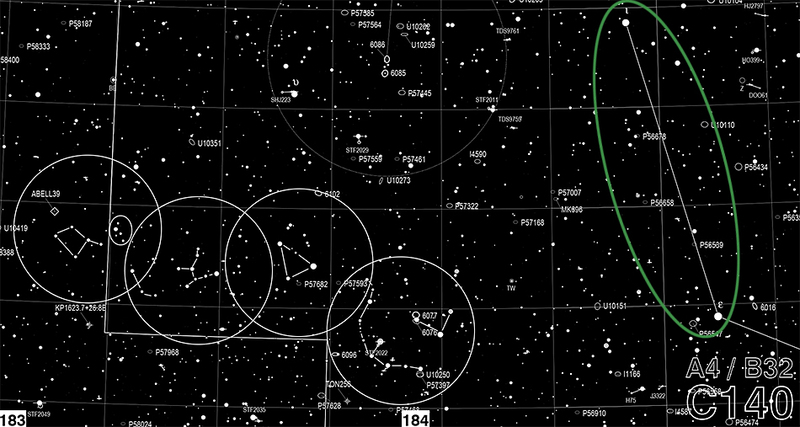 First find the stars Iota and Epsilon Coronae Borealis. Map © 2014 "The Mag-7 Star Atlas Project", www.siaris.net. Map is modified. The map can be downloaded here . Search chart for Abell 39. Star hopping from an area close to Iota & Epsilon Coronae Borealis. The circles correspond to a 1.5° field of view (e. g. a 40 mm 65° eyepiece on a 16" f/4.5 telescope). Map © 2014 "The Triatlas Project", www.uv.es/jrtorres/triatlas.html. Map is modified.